Ending the protracted struggle of the Muslim women to enter into the inner sanctum of the Haji Ali Dargah, the Trust conceded to the demand in the Supreme Court on Monday, reported Times Now. The Haji Ali Trust, which had not been able to justify the ban legally or otherwise, had earlier moved the apex court challenging the Bombay High Court order lifting the ban on women from entering the sanctum sanctorum of the renowned Muslim shrine in South Bombay. The high court had allowed a PIL filed by two women, Zakia Soman and Noorjehan Niaz, from NGO Bharatiya Muslim Mahila Andolan (BMMA), challenging the ban on women's entry into the sanctum sanctorum of the dargah from 2012. The high court had said that the Trust had no power to alter or modify the mode or manner of religious practices of any individual or any group. The Trust’s justification that the ban was imposed for the safety and security of women was shrugged by the high court. The court had noted that the aims, objectives and activities of the Haji Ali Dargah Trust were not governed by any custom or tradition and held that it was a public charitable trust and hence, open to people all over the world, irrespective of their caste, creed or gender. Soman, one of the co-founders of (BMMA), had told Firstpost in August that the Dargah trustees should gracefully accept the HC verdict and implement its order because it was in the same dargah women were allowed to enter the inner sanctum till 2011. They should accept that they made a mistake by barring the women. Talking to Firstpost on Monday, Soman said that they are still waiting for a copy of the order and that they have been given four weeks by the Trust. The Trust has also told the Supreme Court that the order can be implemented after four weeks because the ongoing renovation work would not allow a lot of people to enter the dargah. A bench comprising Chief Justice TS Thakur and Justices DY Chandrachud and L Nageswara Rao granted time to the trust and disposed off its appeal against the Bombay High Court order asking it to give equal access to women also. ANI reported that the Supreme Court had also asked the Dargah authorities whether the order of the Bombay High Court would be implemented in four weeks or not. After this period, Soman says they will all go to the Haji Ali Dargah to offer prayers and chaddar in the inner sanctum. According to her, this result is also a moral victory for the women, who are only demanding equality as citizens. "The court's ruling proves that in India, the judiciary stand by the women in terms of granting them equality and dignity," Soman said. Patriarchy will continue to deny this to women but the recent order proves that women are breaking away of this strangling hold of patriarchy, she added. 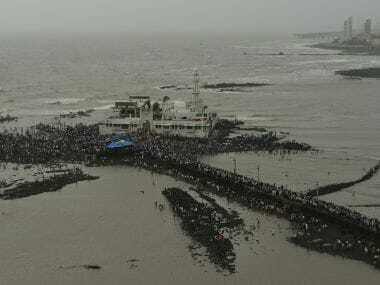 The entire management of the Haji Ali Dargah is in the hands of orthodox men and this recent development will lead to further developments, Soman said adding that it will also help in the fight against triple talaq considering that women are now breaking that stifling hold of patriarchy.